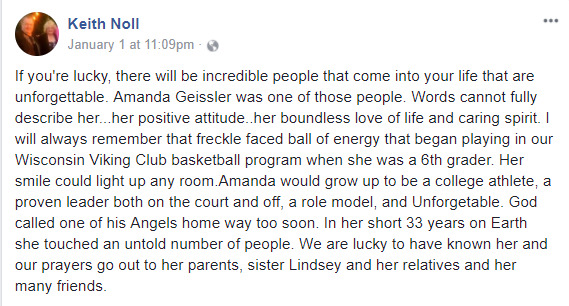 Geissler, was a guide for the California-based adventure travel company Backroads, played for Wisconsin AAU girls basketball club the Wisconsin Viking Club from 1997 through 2003. She coached Team Wisconsin/Viking Club teams throughout her college career, including volunteering at the the 2005 AAU Junior Olympic Games in New Orleans, La. while competing at the University of Wisconsin-Stout for women’s basketball coach Mark Thomas and assistant coach Mark Noll. That same day, longtime AAU member Mark Noll, one of Amanda’s former coaches at Wisconsin-Stout, escaped serious harm as the passenger of a bus carrying his University of Dubuque women’s basketball team home. The Division III team was driving back from a tournament in Nashville, Tenn. When the bus driver passed out going 70 mph, assistant coach Justin Smith leapt from his seat and stopped the bus after ripping a dozen dividers separating the highway. Apart from the driver, everyone on the bus was OK.